While working with the DC Department of Energy and Environment, James Howe designed a three-phased approach to implement a performance contract for buildings managed by the DC Department of General Services. 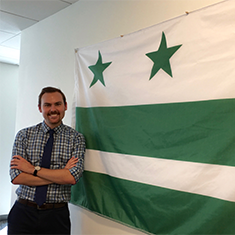 To help improve the Washington, DC, public school system’s energy efficiency, the DC Department of Energy and Environment enlisted EDF Climate Corps fellow James Howe. James was tasked with designing a simple, yet effective way to increase efficiency without increasing upfront costs. Having such a large system with more than 100 schools and thousands of students, it was clear an entirely new approach to managing energy was critical. James identified a performance contract as the best option to pursue. Using this financing technique, energy service companies can install efficiency upgrades with little or no upfront cost, while the District pays back the loan through the realized energy savings. To design the contract, James used a three-phased approach for analyzing energy use in the District. First, he researched municipality best practices of implementing performance contracts. Second, he used advanced statistical methods to analyze building benchmarking data--collected over the course of three years in 15-minute intervals—to provide the backbone of the statistical analysis. The third part entailed assessing an assortment of past energy audits that had been conducted, but not yet analyzed. James identified three distinct areas with potential to generate large savings. As a pilot program, placing five of the public schools that James analyzed into a performance contract has the potential to transform energy use in DC without increasing costs. By switching out inefficient lights with LEDs, adding occupancy sensors and refrigeration controls and upgrading the HVAC systems, the public school system could save nearly 900 mega-watt hours of electricity a year, as well as gain enormous monetary savings. And this would only be a beginning; a successful pilot project has the potential to be scaled throughout buildings across Washington, DC. James Howe is a recent graduate of the UCLA Luskin School of Public Affairs, holding a Master’s Degree in Public Policy, with a concentration in environmental policy. As a UCLA Fellow at the Los Angeles Mayor’s Office of Sustainability, Howe contributed to the first Sustainable City pLAn. He is an avid cyclist and jazz aficionado.